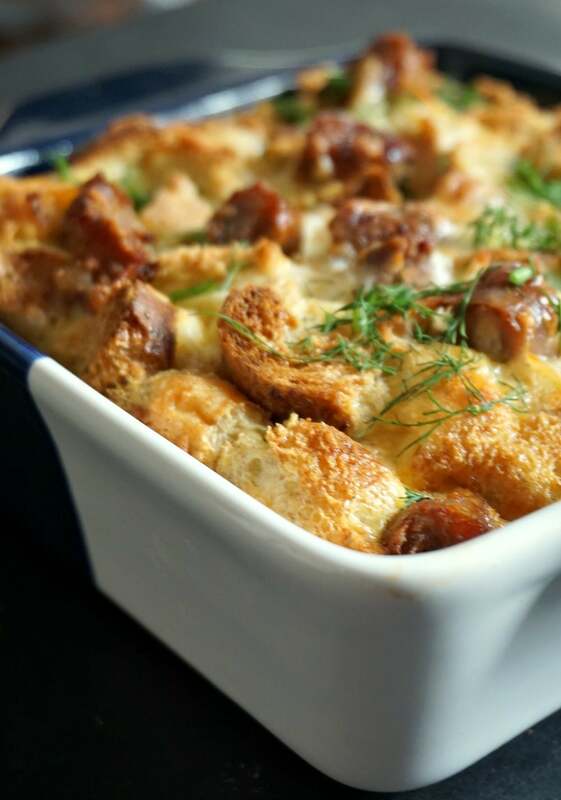 Sausage Egg Breakfast Casserole, a hearty and satisfying dish that can be prepared the night before and refrigerated. Just pop in the oven in the morning, and a heavenly golden casserole will be cooking while you enjoy your cup of tea or coffee. 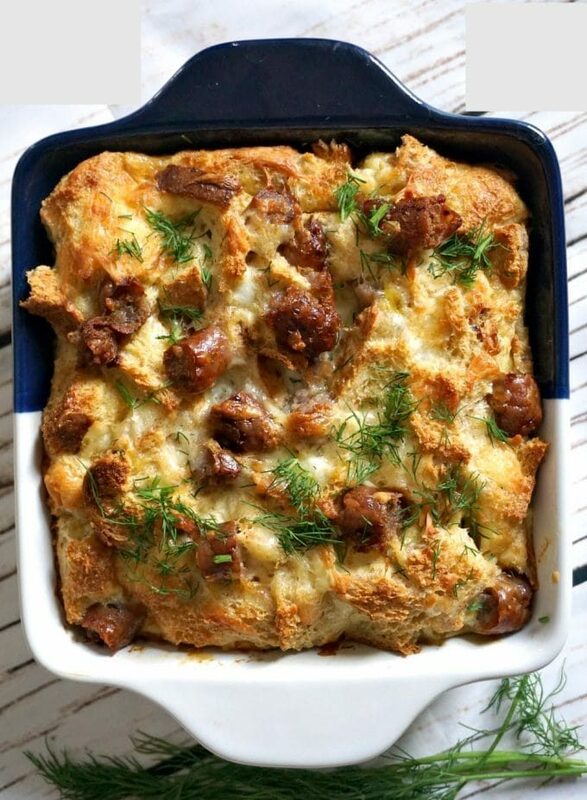 If a Full English Breakfast is the breakfast of all breakfasts, this sausage egg casserole is definitely on the second place when it comes to a filling dish to start your day. Forget about continental, this is the real deal. 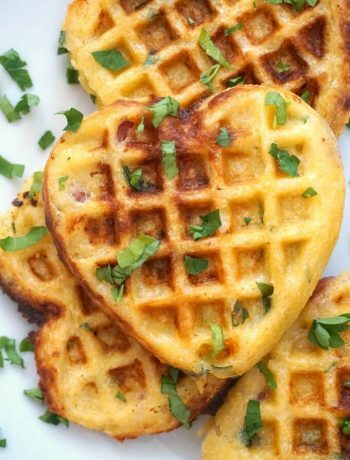 I know the during the week is not always an option to have a cooked breakfast, now and then at weekend we should definitely be for spoiling our taste buds. I wouldn’t have it every day anyway, it’s more the kind of dish you have on special occasions, like Thanksgiving, Christmas or Easter morning, or when you have a family gathering. You probably won’t be ready for lunch until much later, it does make you feel full quickly. Comfort food at its best! How do you make sausage egg breakfast casserole? Nothing simpler, some good old bread, and if you have some that is going to get stale soon, even better, it really does not need to be fresh. You can either toast it a bit, or just use it the way it is, it does not really matter. Cut it up in cubes or just tear it, it won’t make a difference. The sausages need to be cooked though, either fry them or baked them in the oven for about 30 minutes or so, depending on the sausages. Ready to eat ones are also fine, it saves you time cooking them. You can go for any kind of sausages, pork, turkey, chicken, vegetarian, etc. Cheese, again, I used Cheddar, just because I happened to have some in the fridge. Although I always seem to have some in the fridge, it’s our favourite for sure. 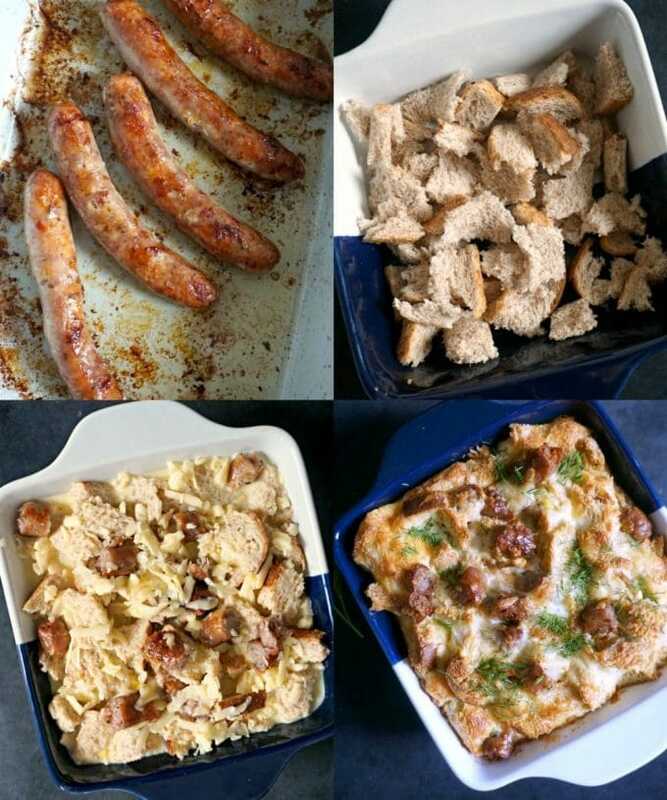 Cut up the bread into cubes, add half the amount on a dish, add half the sausages sliced, grated cheese, then repreat again with bread, sausages and cheese. Beat the eggs lightly, add the milk, season to taste, then pour it over the dish. Leave to chill for at least 2-3 hours, ideally overnight. Bake for 40-45 minutes until golden brown. You can definitely bake it straight away, no need to be refrigerated unless you want to make it the night before, just to save you some time in the morning. Otherwise, once all is prepared, it can go straight in the oven. Don’t bake it at high temperature though, better to leave it at 170 degrees Celsius, or 340 Fahrenheit, otherwise the top will brown too quickly, while the egg mixture won’t be set completely. Now, my casserole is pretty small, since it looks like I’m the only one to enjoy heavy breakfasts, and sausages in general. My darling husband doesn’t really like sausages or anything heavy, and the little ones are usually happy with their lighter breakfast, like pancakes or waffles. My dish is a small square one, I think it measures approximately 6.5×6.5 inches, so 17×17 cm. Double up the amounts if you have a larger family. I certainly enjoyed it, and I can see myself making it again. That’s the kind of food my father would absolutely love, I must make it for him when he comes to visit. It’s definitely a kind of “man food”, meaty, heavy, but absolutely delicious. 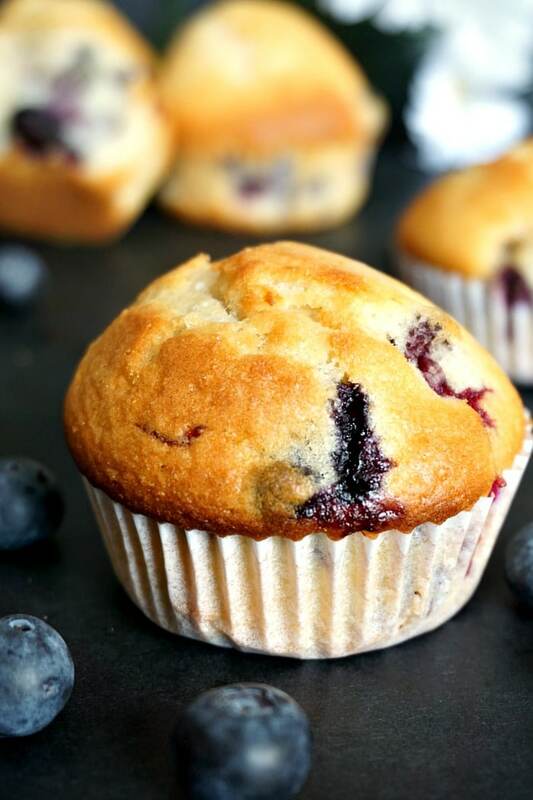 A real morning treat! Do give it a go! 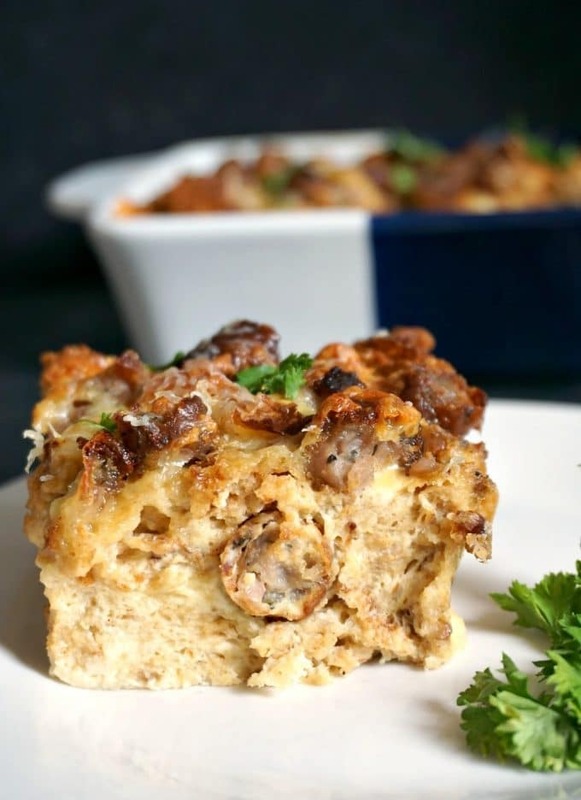 If you’ve tried this OVERNIGHT SAUSAGE EGG BREAKFAST CASSEROLE or any other recipe on the blog then don’t forget to rate the recipe and let me know how you got on in the comments below, I love hearing from you! You can also FOLLOW ME on FACEBOOK, and PINTEREST to see more delicious food and what I’m getting up to. 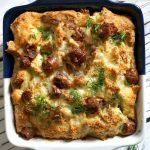 Make ahead sausage egg breakfast casserole, a satisfying and delicious breakfast that can be prepared the night before. Just pop it in the oven in the morning, and it will be cooking while you have your cup of tea or coffee. Toast the bread slices slightly, cut them up into cubes, and put half of them into a square 6.5x6.5 inch oven-proof dish. Slice the sausages, and top the bread cubes with half of the amount of sausages. Sprinkle with half of the amount of grated cheese, the repeat with the remaining bread, sausages and cheese. 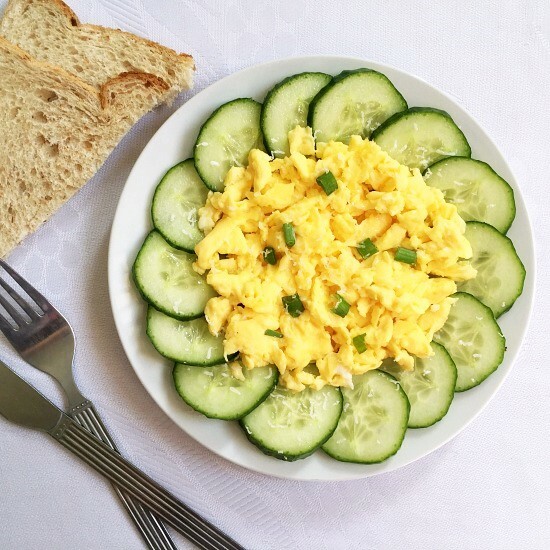 Whisk the eggs slightly, season with salt and pepper to taste, add the milk and whisk again to combine. Pour over the egg mixture, cover with clingfilm and refrigerate overnight. Preheat the oven to 170 degrees Celsius, 340 Fahrenheit. Bake for about 45-55 minutes, or until golden and the egg mixture is cooked. You can also bake it straight away without refrigerating, it will be ready in 45 minutes.